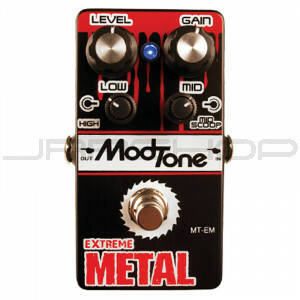 The ModTone Extreme Metal pedal is a true bypass boutique style pedal that delivers insane gain levels that go from subtle to over the top. Our specialized “scoop” knob covers plenty of metal territory while leaving all the articulate definition intact. Adjusting the “Low” knob gives any amp that ground shaking low end thump while the “High” knob lets you dial in just the right amount of top end sweetness.